Hahnemühle's Certificate of Authenticity was designed to protect the security and genuineness of limited edition art works and reproductions on Hahnemühle paper and to reduce the risk of forgery. Each certificate is made of premium deckle edged mould made paper with a Hahnemühle watermark and fluorescent security fibres. A serialised numbered hologram should be attached to this by the artist. A second, identically numbered hologram should then be applied to the reverse side of the artwork. 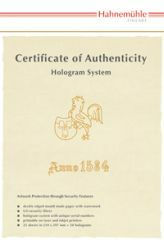 The combination of certificate and hologram assures that each Certificate of Authenticity relates to one particular piece of art. Text and layout of the certificate can be created individually. A template can be downloaded here.